On November 23, 1978, a few believers met at the Hawk church for prayer meeting, Sunday School, and the evening worship service. The men of the church did the preaching for a period of time after which Eddie Burrill came from Liverpool every other Sunday evening to encourage the church in the Word. A church constitution was drawn up, and on April 20, 1979, twenty-one believers signed the membership roll of New Testament Baptist Church. There was a need for a pastor, and a call was given to Rev. F. M. Comley. 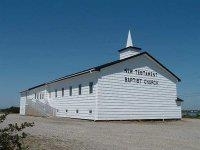 Pastor Comley preached his first sermon on July 29, 1979 in the little church building at the Hawk. The people of the church decided to do the work on the building themselves. They hired one carpenter, who along with the men and women of the church, as well as many friends, began and completed the work of the building to the glory of God. A tribute is to be paid to the people of the church and all those who helped with the building of the current church for the Lord at the Hawk. On September 5, 1980, the church moved into the new building which the Lord had provided. God had given this people a vision, and met their every need. Over the years, the Lord sent other men to lead the church: Edward Burrill, David Mitchell, Alex Poindexter, Gerald Cossaboom, Jonathan Highfill, and currently Paul Lavender. May many souls continue to be saved and God’s people be built up in their faith in this place.